Water heating and the heating of rooms are among the largest items of household spending on energy. Heat energy from the sun is ecologically clean, renewable and free of charge. This is one of the reasons why its use is an important part of modern times. 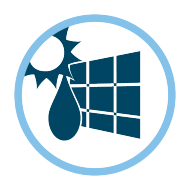 Solar heating uses solar radiation as its energy source, which it then converts to heat. The heat energy obtained can then be used for heating service water or process water, for preheating or for drying. Our company offers construction and service of solutions for solar systems for households, commercial and industrial buildings from basic solutions to complex extensive technological entities. Given that the extent of sunshine in Slovakia is 1400 – 2000 hours a year, solar water heating is a very interesting and sought-after application for renewable energy solutions in households. thot water for pools, saunas and other applications. Solar heating is only possible with direct exposure of solar collectors to light; therefore it is optimally usable in our climatic conditions to produce hot water for households for up to 60 – 75 % of the annual consumption. For installation on industrial buildings or larger buildings, the heat production system is calculated as the optimal ratio to the investment provided or to the installation space. To get a simple idea of the size of the solar system for a household, it is possible to consider a storage tank of 100 liters per person which is connected to solar collectors with an area of 1.5 to 2 m2 per person. Part of the solution is also a controller and pumps. Due to the unreliability of the supply of heat energy to the storage tank, it is necessary to ensure the presence of a storage tank with at least two or more heat exchangers (e.g. a connected gas boiler, solid fuel boiler, hot water fireplace, biomass boiler, electric spiral, a spiral for heating from photovoltaics and other) for the year-round water heating. Of course, for a cost-effective application, it is advisable to have a quotation and installation prepared by our certified specialists. Solar water heating for single-family houses. Solar water heating for commercial or industrial buildings. Nowadays there is much demand for the installation of solar domestic heating. This is mainly thanks to the subsidies being granted, but also due to a shorter payback period. If you would like us to prepare for you a quotation or if you would like to know more about the solutions offered, do not hesitate to contact us.